I decided that in lieu of St. Patrick’s Day, I should make something GREEN . . . and pink and orange and purple! But . . . then those other colors were taunting me, and I caved! These Brownie pops were fun to make. They really were quite easy and are very yummy. I threw all good sense out the window when I decided to jump in and make these. You see . . . my husband doesn’t like brownies unless they are mostly nuts! He’s nuts! I ate one . . . said YUM . . . and gave the Brownie Bouquet away! Step one: Make the Brownies. Make them according to the recipe or package directions. Bake them on parchment paper so you can remove them from the pan completely. Moist, fudgy brownies work best. With a greased knife, cut off the crusts and cut into small bars. Let them cool to where they are easy to handle. Parchment paper makes this process so simple. Cut Off All the Yummy edges. Step two: Mold the brownies into balls. If your brownies are moist and fudgy, they will cling together easily. Grease your hands to keep them from getting too sticky. Try to roll the top of the brownie into the center of your ball. The crackly top has dry edges that make it hard to make your ball nice and round. just like this . . They really aren’t as dark as they seem to look. Step three: Insert craft sticks into each ball. Go ahead and puch them almost all the way down to the bottom. You want to make sure you dont lose your brownie ball while dipping. Let them cool completely before you start dipping them in chocolate. Step four: Dip the brownies in melted chocolate. To melt the chocolate wafers, microwave in 15 second intervals stirring after each until they are smooth. Do not over do it. If you cook the chocolate it will not set up very pretty. Dip the brownie pops into the melted dark chocolate completely. We dont want to see any of the brownie. Mugs work very well for these. They are the perfect size and the thick mug holds the heat in so that the chocolate stays warm for a while. Let the chocolate set before you start dipping the pops in the white chocolate. They will no longer look shiney and will get a dull appearance when the chocolate is set up. I used Wilton Candy Melts, but you could also find these in bulk. I like to dip things in mugs. Dip . . . Dip! Lay each pop on Parchment Paper to cool and harden. Don’t worry if they aren’t perfect. Mine certainly were not! Step five: Dip the brownies in melted white chocolate. Only dip the pops 80% of the way into the white chocolate. It looks nice to see the dark chocolate layer peeking out. Let the white choclate set up a little bit before dipping them any sprinkles. If the chocolate is to drippy the sprinkles will drip right off your pop. but you only dip 80% of the brownie pop, leaving a bit of the Milk Chocolate showing. Step six: Roll the brownies in sprinkles. Standard paper muffin liners worked well to set out all my sprinkles. Only dip them half way up the pops so you can still see the white chocolate layer. Roll them in the sprinkles if you have to. If you are not going to be serving them right away wrap each one individually in plastic wrap and then tie with ribbons. I hope you all have a great St. Patrick’s day. Make these with the kids . . . you will go nuts, and the kids will have a ball! I still plan to post the Puff Pastry Marshmallow cups, but thought I’d be green first. 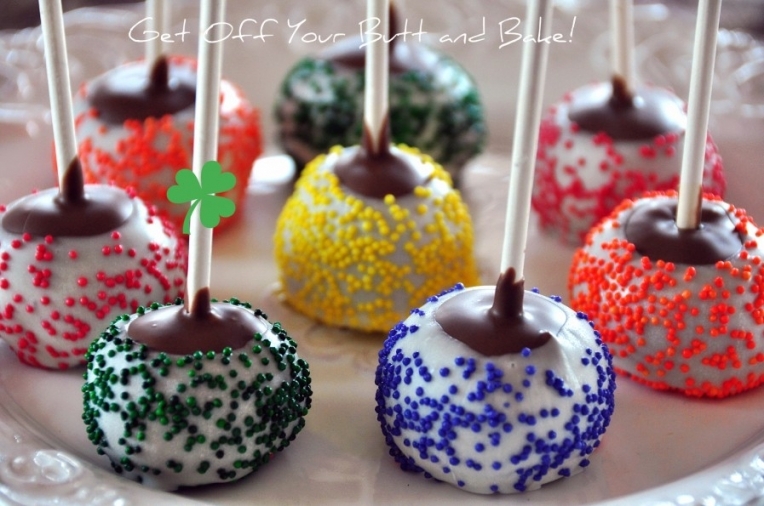 how cute, I love cake pops!! Jonna, how many brownie pops were you able to make out of one batch of brownies? How many days in advance can I make these? I’ll tell you why I ask….I’m making a dessert table for my brother’s wedding-ish reception, party. Thanks ahead of time for the info. Btw, I love your blog and all your photos. Going to try these for the 4th of July – any suggestions on how to make them without the stick? I loved your ideas on the brownie pops. 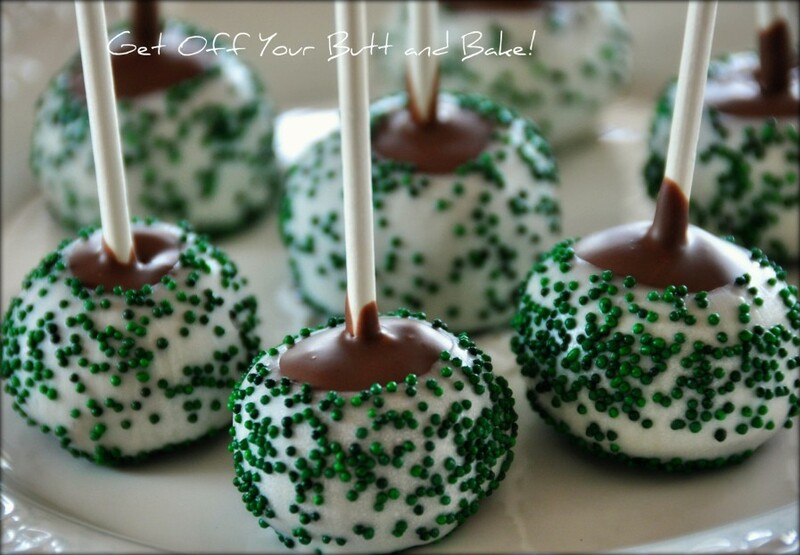 I’m going to try making them this weekend. I want to make them for a 80th birthday party, but I want to make sure they come out before I say anything. This is the first time I have seen your blog and I love it. You have very good ideas. 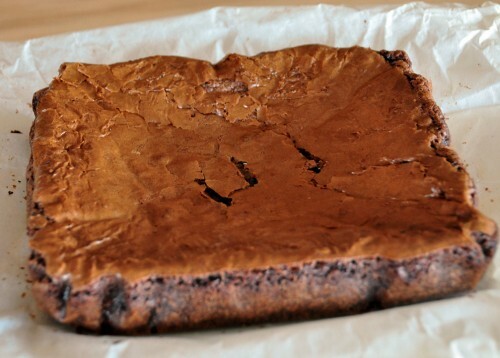 Did you make a 9×13 pan or 8×8 of brownies? How many brownie pops did your recipe make? into the balls. Refrigerate the balls with the sticks inserted, so that the chocolate sets up. This will help secure them, so that they don’t come off. Hopefully this will help for the next go round! I didn’t keep mine in the fridge, just in a tupperware type container. They didn’t last that long! I agree….easy to make and fun to share. Thanks for leaving a sweet one!